Skilled nineteenth-century song composers such as Robert Schumann and Johannes Brahms often exploited tonality and its expectations for symbolic or expressive purposes. About Brahms’s 1873 song “Regenlied” (op. 59 no. 3), for example, Heather Platt observes that “[t]hroughout most of this song the tonic is absent . . . [and] the resulting wandering harmonies . . . create a dream world in which time seems to be suspended” (1999, 248). Broaching the issue of harmony and tonal design in their analysis of German lieder, Deborah Stein and Robert Spillman use the term implicit tonality to refer to “a section of music where a key is suggested (i.e., implied) but not fully (i.e., explicitly) presented” (1996, 135). (1) This essay argues that popular-song composers since the 1960s have often toyed with tonality in much the same way, and that many striking examples of such ephemeral tonal designs can be found in the vast repertoire of pop and rock songs recorded over the past several decades. Before proceeding, however, I will first anticipate my conclusions, positing three tonal scenarios to be explained more fully over the course of the music analyses that follow: 1) songs with a fragile tonic, in which the tonic chord is present but its hierarchical status is weakened, either by relegating the tonic to a more unstable chord in first or second inversion or by positioning the tonic mid-phrase rather than at structural points of departure or arrival; 2) songs with an emergent tonic, in which the tonic chord is initially absent yet deliberately saved for a triumphant arrival later in the song, usually at the onset of the chorus; and 3) songs with an absent tonic, an extreme case in which the promised tonic chord never actually materializes. Example 1 provides a formal synopsis of Daryl Hall and John Oates’ 1973 song “She’s Gone” alongside a summary of the harmonic content in each of the song’s respective sections. (2) Like many pop and rock songs, “She’s Gone” opens with an extended introduction built upon an oscillating two-chord vamp—in this case, close position A major and B major triads alternating over a B pedal. Well over a minute into the track, the vocals enter with the first verse, the initial three lines of which are built upon this same oscillating vamp, yielding fleetingly to G minor-seventh and C minor-seventh chords in the fourth line before returning to the vamp for the song’s second verse. Audio Example 1 contains the end of the introduction through the first and on into the second verse. How are we to make sense of the tonal information that has been presented to us so far? All of the chords conform to a key signature of four sharps, suggesting E major, and yet the tonic chord is notably absent from the verse’s chord progression. In fact, the entire introduction and first two verses seem to be all about prolonging the dominant, with particular emphasis placed on the A major over a B bass “slash” chord that begins and ends each verse. This distinctive keyboard sonority which I have christened the “soul dominant”—best thought of here as a close position IV chord over 5ˆ in the bass, conflating subdominant and dominant functions—is common to many pop and rock styles, but especially prevalent within the lush, extended harmonic language of 1970s soul music, hence its nickname. (3) The resulting effect felt throughout the introduction and first two verses of “She’s Gone” is one of constant tension, setting the stage for the E major tonic chord to emerge triumphantly in the song’s chorus. When the tonic chord ultimately does emerge, however, it is quite fragile, relegated to a passing harmony in first inversion (Audio Example 2). The ending of “She’s Gone” is also special and merits further commentary. Rather than fading out in E major, the third chorus instead gives way to a short but remarkable instrumental break—fully loaded with horns, strings, and a wailing lead guitar—that once again shines a spotlight on the soul dominant and consists of no fewer than three consecutive “truck driver’s modulations” up by semitone. (4) Out of all this the final chorus re-emerges a minor third higher in the chromatic mediant key of G major, above which Daryl Hall’s voice soars with passion and anguish as he hammers home the song’s title lyric and bemoans the loss of his lover for one last round. With nowhere else left to go, the chorus simply repeats and fades away (Audio Example 3). As Walter Everett confirms in his book The Foundations of Rock, non-tonic openings like the one in “She’s Gone” have appeared frequently in pop and rock music since at least the 1960s. Surveying a variety of such songs by the Beatles and others, Everett aptly notes that “these songs all find their tonics eventually, with a rush of familiarity that often seems like the dissipation of clouds” (2009, 215)—a phenomenon that I call an emergent tonic. Yet sometimes this aural game of “hunt the tonic” is not quite so simple, a case in point being the Four Tops’ 1966 #1 Motown single “Reach Out I’ll Be There” (Example 2). 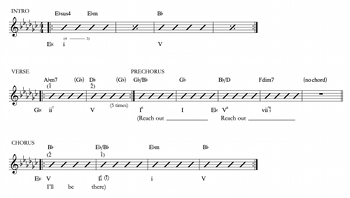 The eight-bar introduction to “Reach Out,” which features the song’s signature flute riff, establishes E minor with chords alternating between i and V every other bar. (5) This sense of E minor as tonic is immediately thwarted at the onset of the verse, however, as the chord progression is taken over suddenly by an oscillating vamp of A minor seventh to D major that repeats five times; these chords get locked into a seemingly ever-repeating loop. As I have shown in my harmonic analysis below the staff, this two-chord vamp may be interpreted as a repeating ii7–V progression searching for its tonic in the relative major key of G , a goal made clear only at the onset of the prechorus (when the title lyric appears for the first time). (6) Almost as soon as G major has been established, the sense of tonic is thwarted yet again as first-inversion and root-position G chords yield to a first-inversion B major chord (these three chords being anchored by James Jamerson’s bass line in falling major thirds), followed by a fully-diminished leading tone seventh chord that leads us back into E minor for the song’s chorus. But even here the tonic is rendered fragile on its re-emergence, as Jamerson stubbornly remains on a B bass note for the first two bars of the chorus, placing the re-emergent E tonic chord initially in second inversion before “correcting” itself to root position in the third measure. To top this off, while Levi Stubbs’s lead vocal emphasizes the pitches F to E , 2ˆ to 1ˆ, on successive downbeats in the first two bars of the chorus, one of the guitarists (presumably Joe Messina) clearly plays an E major triad above Jamerson’s B bass note in the second measure. (7) I invite the reader now to listen to this remarkable series of tonal events in Audio Example 4. Offering his own interpretation of the fragile tonal design of “Reach Out” and how it might contribute to the song’s overall impact, Everett claims that “the confusion, illusion, fear, cold, and drifting that trouble the singer’s love object in the verse turn to raw paranoia in the chorus, and the withholding of harmonic support and clarity are the chief expressive factors” (2008, 116). While Everett limits his survey in The Foundations of Rock to songs composed and recorded during rock’s formative period (through 1969), many other songs with similarly fragile tonal designs can be found among pop and rock songs composed in later decades. Elton John’s top-five pop hit “Someone Saved My Life Tonight,” from his 1975 concept album Captain Fantastic and the Brown Dirt Cowboy, offers another profound example of a song with a fragile tonic. With lyrics written by Elton’s lifelong songwriting partner Bernie Taupin (the “Brown Dirt Cowboy” to Elton’s “Captain Fantastic”), each song on the album provides an autobiographical glimpse into their struggles as young songwriters trying to make it in the London scene in the late 1960s. “Someone Saved My Life Tonight,” based on events from 1969, springs from a time when Elton evidently contemplated suicide until his friend and bandmate Long John Baldry (the “Sugarbear” of the song’s chorus) “saved his life” by convincing him not to risk ruining his burgeoning musical career by marrying his girlfriend and getting trapped in an unhappy relationship. Example 3a shows the song’s signature introductory piano riff, which reappears at crucial junctures throughout the song and also serves as the repeating loop for the song’s fade-away coda. While “Someone Saved My Life Tonight” is unmistakably in A major and the sense of A as tonic becomes clearer as the melody unfolds, the initial tonic chord of the piano riff is in second inversion and hence sounds particularly unstable and fragile, especially as it alternates with a root-position D major chord. The bar-to-bar alternation between G and G , as part of the octave-doubled ascending and descending scalar flourishes in the left hand, complicates the issue of discerning the tonal center of the piano riff even further. It might be tempting to say that the tonal center here is trying to shift to the subdominant D , but rather than a shift of key center, I prefer to think of this as an instance of what David Temperley (2011) calls “scalar shift”—in this case, one shift in the flatwards direction, replacing 7ˆ with 7ˆ. In other words, this represents a back-and-forth alternation between Ionian and Mixolydian modes of the same key. Example 3b provides a harmonic reduction of the verse and chorus. The verse begins on the same fragile second-inversion A tonic chord, which again does not behave as a six-four chord would do in Classical tonality, resolving to a root-position IV chord that quickly moves by way of a passing G chord toward an odd-sounding cadence on its own fragile second-inversion chord (a D major triad over an A bass). The next phrase begins with oscillating G –A chords that again sound to me a like a temporary scalar shift to the Mixolydian mode, hence VII–I. The root-position A chords that occur at this point during the verse progression provide the only instances of root-position tonic chords in the whole song, yet they hardly sound like stable points of arrival. In fact, after one repetition of the oscillating VII–I chords in half notes, the verse progression continues with D major (IV) and the borrowed D minor (iv) for one measure each, followed by a B dominant seventh that does not resolve immediately as a V7 of V but instead swerves back to the IV chord. The bass then creeps chromatically upwards toward 5ˆ, with the verse culminating on a big half cadence decorated with a cadential six-four that this time does resolve conventionally. Audio Example 5 presents the opening minute of the song, from the introductory piano riff through the half cadence ending the first verse. Following this half cadence, the ensuing chorus once again defies the expectations of Classical tonality by beginning not on the tonic but on the root-position IV chord, with the title lyric “Someone Saved My Life Tonight” set to the same IV–passing I6–ii progression that we heard in the chorus to “She’s Gone” (also reminiscent of the refrain from another famous song with suicidal tendencies, Brian Wilson’s 1966 masterpiece “God Only Knows” from the Beach Boys’ Pet Sounds). (8) With the harmonic design of the chorus even more unstable than the verse, here again the bass ultimately creeps upwards chromatically toward 5ˆ, at first overshooting it to 6ˆ before doubling back to 4ˆ and climbing again chromatically to 5ˆ as Elton sings the melodic climax of the chorus—“. . . fly away, high away!”—over another painfully fragile second-inversion tonic. (9) Yet immediately after this climactic moment, the second-inversion A chord yields again to the IV chord (D major), this time slyly by way of a deceptive resolution of V7 of vi, musically portraying the idea of a butterfly “flying away.” The three-bar tag that closes the chorus overshoots A and comes to rest momentarily on the VII chord (G major), which functions in context like a retransitional dominant (with VII substituting for V, as it often does in modal rock harmony) leading back to the second-inversion A chord of the opening piano riff. Audio Example 6 picks up from the onset of the chorus. The fragile tonal design of “Someone Saved My Life Tonight,” with what seems to be a deliberate avoidance of tonic chords in root position for most of the song, mirrors perfectly the fragile emotional state of the song’s protagonist (which, in this case, we can assume to be Elton John himself). I do not profess to have to undertaken a systematic corpus study of post-1950s pop and rock songs (such as de Clerq and Temperley  and others have done) and am therefore relying on the large database of pop and rock songs that I carry around in my head, but I think it’s pretty safe to say that most if not all songs with fragile tonics that similarly feature an abundance of second-inversion chords (and with a bass that snakes up and down mostly stepwise) were composed at the piano and not the guitar, since guitar-driven pop and rock songs tend to favor root-position “power” chords (octave-and-fifth doubled, with the third often omitted) and as a result lack the degree of voice-leading independence more typical of keyboard-driven songs. In certain extreme cases, however, the promised tonic chord never actually materializes. But before considering some examples of truly absent tonics, let us ponder more closely this phenomenon of oscillating two-chord vamps. Example 5 shows four such vamps that are commonly found in pop and rock songs, with the Roman numerals below indicating their possible harmonic-functional interpretations (for ease of comparison, all four are transposed to begin with a chord on G). The first vamp alternates a major chord with a minor chord whose root lies a whole step above. Depending on such variable factors as durational accent, the presence or absence of a bass pedal tone, precisely which pitches are emphasized in the vocal melody and/or riffs sounding above these chords, and which of the two chords is sounded first, it is possible in the context of an actual song for the ear to latch on to one or the other of these chords as the tonic—that is, as either a repeating I–ii in major (as in, for example, the Beatles’ “Don’t Let Me Down” , where the ii chord sounds first), or a VII–i in minor (as in, for example, Frankie Goes to Hollywood’s “Relax” , where the i and VII chords oscillate over a tonic pedal). (11) Similarly, the second vamp may be interpreted either as a repeating I–vi in major (as in the opening of the Beatles’ “From Me to You” ), or a repeating III–i in minor (as in the verses of the Police’s “Invisible Sun” ). The third vamp consists of a minor chord alternating with a major chord whose root lies a fifth below. While this vamp, as we saw in “Reach Out,” can sometimes function as a repeating ii–V in major searching for its tonic, in modal rock songs the first chord will more often than not assume the status of the tonic itself, resulting in a Dorian i–IV (as in the Zombies’ “She’s Not There” , for example, as well as several of the songs on Pink Floyd’s The Dark Side of the Moon  and many songs by Santana—so much so, in fact, that Frank Zappa and his band in the late 1970s jokingly nicknamed G minor to C major as the “Carlos Santana Secret Chord Progression”). (12) This brings us to the fourth vamp, the most problematic of all, which consists of two alternating major chords whose roots lie a whole step apart and therefore might be interpreted in context as a Lydian I–II . As Everett explains in The Foundations of Rock, “the Lydian scale is marked by the most dissonant of intervals, the augmented fourth, involving the tonic scale degree and the distance from 1ˆ to 4ˆ” (Everett 2009, 256). He then cites several examples of 1960s pop and rock songs featuring an oscillating I–II vamp, which he calls a “Lydian fingerprint,” such as the opening of the verse of the Turtles’ 1967 hit “You Know What I Mean.” In this particular song, however, the I–II oscillating vamp is quickly relieved—corrected, if you will—after only two iterations by the ensuing IV chord, which replaces the raised 4th scale degree with a plain 4. Much more problematic for discerning a tonal center are cases in which an oscillating vamp of two whole-step related major chords serves as the harmonic foundation for an entire section, or even—in extreme cases—an entire song. Another of my favorite examples of a song that promises a tonic which never fully materializes is the Spinners’ 1972 #1 soul hit “I’ll Be Around” (Example 6b), a simple verse–chorus form built entirely upon a circular groove involving alternating E major-seventh and F major added-sixth chords. (14) The opening of the song is provided in Audio Example 9. Again, one might be tempted to hear this looping progression as some sort of Lydian I–II , but everything else in the track—from Bobbie Smith’s vocal melody, which persistently outlines a G -minor triad and repeatedly comes to rest locally on the pitch G , to the signature string/horn riff during the instrumental break, which marches down what is clearly a G Aeolian scale with D , 5ˆ, as its head note—points toward hearing this progression against the backdrop of G minor: hence, an Aeolian VI– VII with “absent” i. The song’s chorus and instrumental break are provided in Audio Example 10. This ever-repeating VI– VII, which always drops back to “resolve” on the VI chord and avoids cadencing on the promised tonic, is an example of what I have dubbed “the Sisyphus effect”—that is, a sequence of chords with their bass notes ever moving stepwise up a hill, only to fall back down to the bottom either just before (as in “I’ll Be Around”) or as soon as the goal tonic is reached. 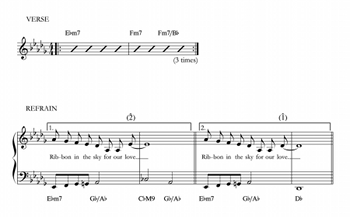 In a further illustration of this effect, Example 7 shows the repeated chord progression undergirding the verses and choruses of the Human League’s 1986 hit “Human” (a song composed by R&B producers Jimmy Jam and Terry Lewis). (15) The song begins with a catchy two-bar drum machine loop over an extended pedal drone on D that repeats four times, creating an eight-bar introduction. The extended pedal might lead us to expect D as the tonic, yet the progression that emerges confirms A as the tonic. With 5ˆ held as a common tone in the upmost voice, the bass marches up the hill from 4ˆ to 1ˆ; as soon as the tonic is reached, however, the progression slips back down to the IV chord. Ultimately the song will fade out on the same pedal D as it began, but I prefer to think of this song as being in a fragile A major, mirroring the fragile emotional condition of the cheating couple who keep plaintively reiterating in the chorus, “I’m only human, of flesh and blood I’m made.” It seems only appropriate that every time the fidelity of the tonic chord is reached, the progression falls back down the hill and the cycle repeats. Example 10c shows the four-bar loop that sounds for the entirety of Daft Punk’s 2013 Grammy-winning song “Get Lucky” (featuring Pharrell Williams on vocals), the song that duked it out with Robin Thicke’s “Blurred Lines” for the title of that summer’s biggest hit. My notated example simplifies the groove to show only the right-hand piano chords and the essential bass rhythm, a four-chord pattern of B minor-seventh–D major–F minor-seventh–E major. I should point out that on the track itself, bassist Nathan East constantly improvises around this basic pattern with octave leaps and fills and varies the bass pattern with each repetition. Identifying the tonic in “Get Lucky” is not so simple. I posed this challenge to a group of my theory and musicology graduate students, asking them: “If you had to assign functional Roman numerals to this four-chord pattern, what would you do?” So, I am going to ask readers of this essay the same question now as you listen to the first pass through the introduction, verse, prechorus, and chorus (Audio Example 16). The topmost notes of the piano chords trace a stepwise descent from D down to B. In addition, the prechorus melody follows the bass in parallel tenths and therefore seems wedded to the underlying chord loop rather than being divorced from it—so, the first chord of the loop, B minor, as tonic? 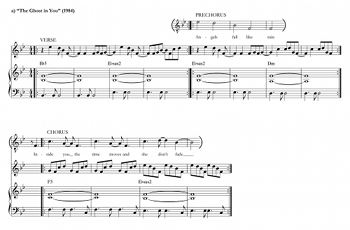 The melody of the chorus is composed of a series of one-bar fragments that in the fourth measure seems to “arrive” on A (this fourth measure of the chorus melody is then repeated over and over again in the manner of a refrain). If we were to sing this melody in isolation and assign solfège syllables to it, then our most likely instinct would be to interpret this melody in A major, ending as it does with a 3ˆ–2ˆ–1ˆ descent. Following this logic, we would interpret the four-chord loop as ii7–IV–vi7–V with an absent tonic. In the end, much as it would be gratifying to posit “Get Lucky” as another perfect example of a song with an absent tonic (especially since the Roman numerals fit so nicely in A major), the Dorian loop—i7– III–v7–IV, hence an expansion of the Dorian shuttle i–IV—trumps all other possible hearings. For one thing, I have to “squint my ears” very hard to hear A as the tonic in the chorus melody as it unfolds over the repeating chord loop, especially considering the weak metric position of A on the final eighth note of the measure. This positioning undermines any sense of arrival, and instead the A seems to wrap back around repeatedly as a neighbor tone to B, as the one-bar melodic hook itself loops at the end of the chorus over the rotating four-chord cycle below. (27) More importantly from a rhythmic and metric standpoint, the groove underpinning “Get Lucky” gives us a textbook example of what Tim Hughes (2008, 242) calls an autotelic groove, with Nathan East’s anacrustic fills in the bass at the end of every fourth bar pushing forward into the next downbeat, causing the first measure of each four-bar pattern to sound simultaneously like a beginning and an ending—that is, as both a point of departure and a goal—and thus further strengthening the sense of B minor as tonic. (28) Yet it is mainly here for me a question of style: for this song, Daft Punk collaborated with Nile Rodgers, the mastermind behind the late-1970s disco group Chic, and there the groove and harmonic language of “Get Lucky” amounts to a deliberate throwback or homage to this earlier style. Every time I hear this song (which, needless to say, has been frequently since 2013), I situate it among the other late-1970s funk and disco tracks that I know and have been playing live myself for years, many of which are built squarely on Dorian loops and shuttles. Audio Example 17 contains the first 25 seconds of one widely known example from Nile Rodgers himself, Chic’s “Good Times” (U.S. #1, U.K. #5 ), which is set entirely over an ever-repeating minor i to major IV. For our final and most harmonically complex example, I will remain around the turn of the 1980s and consider a song recorded by the late great King of Pop, Michael Jackson. “Rock With You” was the second of Jackson’s two #1 singles from his 1979 breakthrough solo album Off the Wall, and Example 11 provides a summary of its formal and harmonic content. Again, with the exception of one chord in the bridge, I have deliberately refrained from offering a Roman numeral harmonic analysis, but I invite you now to do so yourself as I discuss the various sections of the song. Audio Example 18 contains the opening minute or so of the track, which represents the first pass through the introduction, verse, prechorus, and chorus. Once again, one of the main reasons to hear “Rock With You” in D major is because of its revealing resemblances to another hit song from around that same time period making some uncannily similar harmonic moves, Stevie Wonder’s 1982 ballad “Ribbon in the Sky” (Example 12). Like “Rock With You,” “Ribbon in the Sky” opens with an extended E -minor sonority, and the verse is built around a three-chord loop that repeats three times. In the manner of an antecedent–consequent period, the song’s refrain—the harmonic design of which bears a strong resemblance to the prechorus of “Rock With You,” as both are built on a bass walkup from 2ˆ to 5ˆ—cadences on the soul dominant the first time around, supporting 2ˆ in the melody and effecting a half cadence, but the second time around does succeed in finding the D tonic chord that remains so elusive in the earlier track. To summarize: in order to make a claim for a song as having an absent tonic, enough aural information in the song’s chord progressions and melodies must be available for us to discern the tonic when heard against the backdrop of a “default” major or minor (i.e., Ionian or Aeolian) system in most instances, or, in rare cases, another tonal system (such as the major triad-doubled minor-pentatonic system unique to rock; see n. 17). Conversely, for the other diatonic modal systems used in pop and rock songs—Dorian, Mixolydian, Phrygian, and even Lydian—the tonic chord must always be present for that mode to assert itself. (32) The tonic chord may well initially be absent only to emerge later in the song, as in “She’s Gone,” “Little Red Corvette,” and “Man on the Moon,” or else it may never materialize, as in “Jane Says,” “I’ll Be Around,” and “Love My Way.” And though not always the case, it is no surprise that in many instances these songs tell the story of a romantic relationship gone bad, in which case the absent tonic serves as a powerful musical metaphor for lost love. The question of tonality in pop and rock music is by no means simple and has no single answer, yet by positing a continuum of varying states of tonal stability—from fragile to emergent to absent tonics—I hope to have offered a conceptual framework as an aid to understanding how tonality has been deployed for expressive purposes in popular songs across a wide range of styles and genres during the last fifty years. (33) Of course, a fadeout would probably be the most elegant and appropriate way to end this essay, but I shall have to leave that to the reader’s imagination. Attas, Robin. 2015. “Form as Process: The Buildup Introduction in Popular Music.” Music Theory Spectrum 37 (2): 275–96. Capuzzo, Guy. 2009. “Sectional Tonality and Sectional Centricity in Rock Music.” Music Theory Spectrum 31 (1): 157–74. Covach, John. 1994. “Deconstructing Cartesian Dualism in Musical Analysis.” Music Theory Online 0.11. Covach, John. 2005. “Form in Rock Music: A Primer.” In Engaging Music: Essays in Musical Analysis, ed. Deborah Stein, 65–76. Oxford University Press. —————. 2005. “Form in Rock Music: A Primer.” In Engaging Music: Essays in Musical Analysis, ed. Deborah Stein, 65–76. Oxford University Press. De Clercq, Trevor and David Temperley. 2013. “Statistical Analysis of Harmony and Melody in Rock Music.” Journal of New Music Research 42 (3): 187–204. Doll, Christopher. 2011. 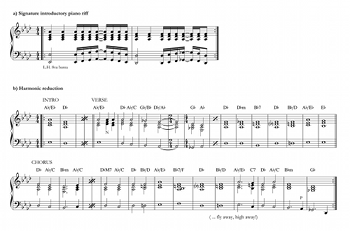 “Rockin’ Out: Expressive Modulation in Verse–Chorus Form.” Music Theory Online 17.3. Everett, Walter. 1997. “Swallowed by a Song: Paul Simon’s Crisis of Chromaticism.” In Understanding Rock: Essays in Musical Analysis, ed. John Covach and Graeme M. Boone, 133–53. Oxford University Press. Everett, Walter. 2001. “A True Story: The Expression of Troubling Societal Values in the Music of Postmodern Rock.” Genre 34: 205–18. —————. 2001. “A True Story: The Expression of Troubling Societal Values in the Music of Postmodern Rock.” Genre 34: 205–18. Everett, Walter. 2004. “Making Sense of Rock’s Tonal Systems.” Music Theory Online 10.4. —————. 2004. “Making Sense of Rock’s Tonal Systems.” Music Theory Online 10.4. Everett, Walter. 2008. “Pitch Down the Middle.” In Expression in Pop-Rock Music: Critical and Analytical Essays, 2nd edition, ed. Walter Everett, 111–74. Routledge. —————. 2008. “Pitch Down the Middle.” In Expression in Pop-Rock Music: Critical and Analytical Essays, 2nd edition, ed. Walter Everett, 111–74. Routledge. Flory, Andrew. 2017. I Hear a Symphony: Motown and Crossover R&B. University of Michigan Press. Griffiths, Dai. 2015. “Elevating Form and Elevating Modulation.” Popular Music 34 (1): 22–44. Harrison, Daniel. 1997. “After Sundown: The Beach Boys’ Experimental Music.” In Understanding Rock: Essays in Musical Analysis, ed. John Covach and Graeme M. Boone, 33–58. Oxford University Press. Hirsh, Marc. 2008. “Striking a Chord.” The Boston Globe (December 31). Hughes, Tim. 2008. “Trapped within the Wheels: Flow and Repetition, Modernism and Tradition in Stevie Wonder’s ‘Living for the City.’” In Expression in Pop-Rock Music: Critical and Analytical Essays, 2nd edition, ed. Walter Everett, 239–65. Routledge. Krebs, Harald. 1981. “Alternatives to Monotonality in Early Nineteenth-Century Music.” Journal of Music Theory 25 (1): 1–16. Moore, Allan F. 1995. “The So-Called ‘Flattened Seventh’ in Rock.” Popular Music 14 (2): 185–201. Nobile, Drew. 2015. “Counterpoint in Rock Music: Unpacking the ‘Melodic-Harmonic Divorce.’” Music Theory Spectrum 37 (2): 189–203. Pallett, Owen. 2014a. “Skin Tight Jeans and Syncopation: Explaining the Genius of Katy Perry’s ‘Teenage Dream’—Using Music Theory.” Slate (March 25). Pallett, Owen. 2014b. “Ecstatic Melodic Copulation: Explaining the Genius of Daft Punk’s ‘Get Lucky’—Using Music Theory.” Slate (March 28). —————. 2014b. “Ecstatic Melodic Copulation: Explaining the Genius of Daft Punk’s ‘Get Lucky’—Using Music Theory.” Slate (March 28). Peres, Asaf. 2016. “(Dys)Functional Harmony: How Sound Production in Twenty-First Century Pop Music Liberates Harmony from its Functional Role.” Paper presented at the annual meeting of the Society for Music Theory, Vancouver. Platt, Heather. 1999. “8 Lieder und Gesänge, Opus 59.” In The Compleat Brahms: A Guide to the Musical Works of Johannes Brahms, ed. Leon Botstein, 247–51. Norton. Richards, Mark. Forthcoming. 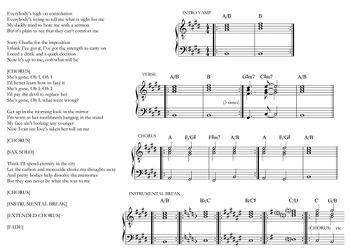 “Tonal Ambiguity in Popular Music’s Axis Progression.” Music Theory Online 23.3. Robison, Brian. 2013. “‘A Prayer From Your Secret God’: The Sensitive Female Chord Progression as a Veiled Symbol of Religiosity.” In Music: Function and Value. Proceedings from the 11th International Conference on Musical Signification, ed. Teresa Malecka and Malgorzata Pawłowska, 656–66. Akademia Muzyczna w Krakowie and Musica Iagellonica. Satyendra, Ramon. 1997. “Liszt’s Open Structures and the Romantic Fragment.” Music Theory Spectrum 19 (2): 184–205. Schmalfeldt, Janet. 1992. “Cadential Processes: The Evaded Cadence and the ‘One More Time’ Technique.” Journal of Musicological Research 12: 1–52. Smith, Jeremy. 2016. “‘I Know It’s Over’: Melodically-Established Keys and Tonal (Non-)Closure in Contemporary Pop Music.” Paper presented at the annual meeting of the Society for Music Theory, Vancouver. Stein, Deborah and Robert Spillman. 1996. Poetry into Song: Performance and Analysis of Lieder. Oxford University Press. Tagg, Philip. 2014. Everyday Tonality: Towards a Tonal Theory of What Most People Hear. Expanded and improved edition. The Mass Media Music Scholars’ Press. Temperley, David. 2011. “Scalar Shift in Popular Music.” Music Theory Online 17.4. —————. 2011. “Scalar Shift in Popular Music.” Music Theory Online 17.4. * My ideas in this article have been gestating for a number of years, appearing first in a paper presented at the 2009 annual meeting of the Society for Music Theory in Montréal (with the title “Absent Tonics in Pop and Rock Songs”), and subsequently as one-hour lectures given at the University of Cincinnati College-Conservatory of Music in 2014, and at the University of Rochester Institute for Popular Music/Eastman School of Music and the University of North Texas in 2016 (with the title “The Question of Tonality in Pop and Rock Songs”). I am grateful to those who have offered their valuable feedback on earlier versions, most notably John Covach, Walter Everett, Drew Nobile, Brad Osborn, and MTO editor Nicole Biamonte. I am especially grateful to my CUNY graduate students who served as a sounding board for these analyses in the context of stimulating class discussion. Finally, I wish to thank Christopher Segall for expertly setting the musical examples. My ideas in this article have been gestating for a number of years, appearing first in a paper presented at the 2009 annual meeting of the Society for Music Theory in Montréal (with the title “Absent Tonics in Pop and Rock Songs”), and subsequently as one-hour lectures given at the University of Cincinnati College-Conservatory of Music in 2014, and at the University of Rochester Institute for Popular Music/Eastman School of Music and the University of North Texas in 2016 (with the title “The Question of Tonality in Pop and Rock Songs”). I am grateful to those who have offered their valuable feedback on earlier versions, most notably John Covach, Walter Everett, Drew Nobile, Brad Osborn, and MTO editor Nicole Biamonte. I am especially grateful to my CUNY graduate students who served as a sounding board for these analyses in the context of stimulating class discussion. Finally, I wish to thank Christopher Segall for expertly setting the musical examples. 1. Spillman and Stein go on to discuss a well-known example of implicit tonality, the first song of Schumann’s 1840 Dichterliebe cycle, “Im wunderschönen Monat Mai,” in which “both the song’s recurring unresolved V7s throughout and ending on V7 convey the poet’s unfulfilled longing and desire” (1996, 135). This is not unlike what Ramon Satyendra, drawing upon the aesthetics of the Romantic fragment, calls “open structures” in the music of Franz Liszt, which he defines as “Liszt works that are based on a dissonant [i.e., non-tonic] chord, yet rooted in diatonicism” (1997, 205). 2. Hall & Oates typified so-called “blue-eyed soul” in the 1970s, being one of the few white acts to emerge from Philadelphia’s burgeoning soul music scene early that decade. 3. 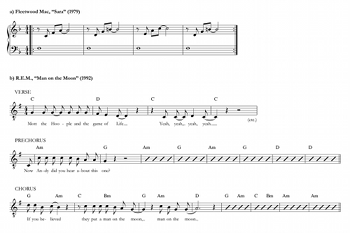 The chord most likely has varied origins, both in gospel piano playing and in American popular song from the first half of the twentieth century. The soul dominant is most commonly voiced as a IV triad over 5ˆ, but can also appear as a close position ii7 or IV7 chord in the right-hand part, hence adding a fifth note to the basic four-note sonority. An important feature to remember about the soul dominant is that, despite its dominant function, the chord contains the tonic note amidst its upper voices and never includes the leading tone. The four-note soul dominant is usually labeled in harmonic analyses with the functional Roman numeral V11, understood as shorthand for a V chord with intervals of a seventh, ninth, and eleventh above the bass (see, e.g., Temperley 2011, [3.10], and Tagg 2014, 228). While the soul dominant is most commonly found in songs in major keys (or, if you prefer, the Ionian mode), as in “She’s Gone,” it can be found in minor or Aeolian songs as well, in which case the chord typically is not built upon 5ˆ in the bass but rather 7ˆ, with a close position iv7, VI, or VI7 in the right-hand part above (in other words, the same pitches as the soul dominant from its relative major), hence serving as a substitute for the plain VII chord that often serves the functional role of dominant in modal rock harmony; for example, the main groove from A Taste of Honey’s 1978 #1 disco hit “Boogie Oogie Oogie” is built around oscillating D minor-seventh and B /C chords, or i7– VII11. 4. Walter Everett defines a truck driver’s modulation as “a sudden shift from one tonal center to another—usually a half step above—that is not functionally related to the first” (1997, 118). Dai Griffiths prefers the term “elevating modulation” and presents a useful four-part schema to explain the four most common harmonic situations that typically occur in popular songs at the formal junctures of such modulations. Griffiths cites the final series of three consecutive T1 modulations in “She’s Gone” as a “breathtaking” example of his third type of elevating modulation, the “dominant handover” (2015, 38). 5. One might interpret this opening vamp not as i–V in E minor but rather as iv–I in B major (i.e., with a borrowed minor iv chord), although this is not the way I hear it. Circular chord progressions in pop and rock songs are often ambiguous with regard to their tonal center, especially in instances where such short progressions could just as easily be interpreted in a major key or its relative minor (which is not the case in the “Reach Out” introduction, but we shall see that it is so in Prince’s “Little Red Corvette” and other examples later in this essay). The opening pitch in the flute melody, A , behaving in context more like 4ˆ in minor (as part of a 4–3 figure above 1ˆ in the bass) than a flatted seventh degree in major, tips the scale for me in the direction of E minor. For an extensive discussion of the notion of ambiguity in rock harmony, see Doll 2017, Chapter 6, “Ambiguous Effects”; see also Richards (forthcoming). 6. As I have shown in parentheses above the staff, the guitars play quick G chords at the end of both measures within each two-bar cycle, but the bass guitar does not comply and instead carves out an active bass line around the chord roots of the oscillating ii–V progression. (An organ—buried deep in the mix—also simply moves back and forth between A and D chords without any intervening G chords.) I am therefore considering these metrically weak G chords as embellishing (neighboring) sonorities in the upper voices and not full-fledged chord changes. Flory (2017, 63) provides a transcription of the complete texture of this oscillating verse vamp. 7. I had long thought that this E major chord sounding in the upper voices was played on a piano, but Motown expert Andrew Flory has confirmed for me that there is actually no piano on this track. Motown’s primary house keyboardist at the time, Earl Van Dyke, was contracted for the July 8, 1966 session when “Reach Out” was recorded (along with two other songs) and is therefore most likely the one playing the organ part. 8. For an insightful analysis of “God Only Knows,” similarly focusing on the expressive effects of the unstable six-four chords and the song’s utter lack of resolution to a root-position tonic, see Harrison 1997, 39–40. 9. This passage during the chorus of “Someone Saved My Life Tonight”—in which a promised cadence is evaded, and instead the music “backs up” to repeat the cadential idea—reminds me of a similar technique often utilized by late-eighteenth century composers (especially Mozart) to extend phrases, which Janet Schmalfeldt (1992) has called the “one more time” technique. 10. Christopher Doll (2011) uses the term “breakout chorus” to refer to any song whose chorus represents a marked increase in intensity over the preceding verse (a feature common to many if not most pop and rock songs), but especially those choruses involving a shift of tonal center from a minor key to its relative major. While I do not hear the verse of “Little Red Corvette” as fully “in” the key of B minor, so that the chorus does not “modulate” to D major, the expressive or “breakout” effect in this song is essentially the same at the moment the emergent tonic chord replaces vi. For a detailed exploration of this thorny issue of monotonality vs. “sectional tonality” and “sectional centricity” in rock music, see Capuzzo 2009. There is no easy answer to this question, but in my view, the deciding factor as to whether or not I interpret a song as sectionally tonal or monotonal with an emergent or absent tonic usually has to do with the expressive potential that comes from withholding a tonal center, as I hope to demonstrate further in the analyses that follow. Though such situations are rare, it is entirely possible for a song to have two or more competing yet equally important tonal centers but for the tonic chord to be absent in each of its sections, as we shall see with the Psychedelic Furs song “Love My Way” (Example 9b). 11. It is also possible, of course, for major and minor triads related by whole step to function locally as V–vi in major, yet I can think of no example from the pop-rock repertoire in which we hear a repeating V–vi progression used as an extended vamp (i.e., V–vi with an “absent” I). After polling some experts on rock harmony, the closest example we could come up with is Bob Dylan’s “I Shall Be Free No. 10” from Another Side of Bob Dylan (1964)—specifically, the funny little repeated tag at the end of each strophe, V–vi–V–vi–V–I, where on its final iteration Dylan breaks the fourth wall by saying, “what’s probably got you baffled more is what this thing here is for.” I am grateful to Walter Everett for bringing this example to my attention. 13. Interestingly, when playing “Jane Says” live (several 1990s performances of which can be found on YouTube), Jane’s Addiction would often append an instrumental introduction by jamming around the D major tonic chord before launching into the repeating IV–V riff, which suggests to me that Perry Farrell and company were fully aware of their song’s absent tonic. Nobile offers an analysis of “Jane Says” that shows how the vocal melody goes on to articulate a full-fledged AABA form, with the melody in the bridge (or B section) distinguishing itself by outlining scale degrees of the dominant harmony, “all by virtue of its melodic-harmonic divorce” (2015, 196). 14. 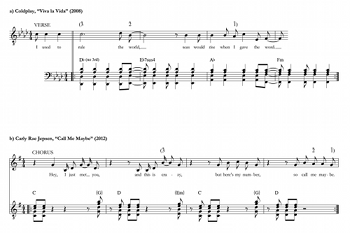 John Covach (2005) uses the term simple verse–chorus form to describe songs in which the verse and chorus are set over the same chord changes (as opposed to contrasting verse–chorus form which uses a different set of chord changes for the verse and chorus, examples of which we heard in “She’s Gone,” “Someone Saved My Life Tonight,” and “Little Red Corvette”). 15. U.K. synthpop group the Human League are probably best known for their massive 1981 single “Don’t You Want Me,” which reached #1 on both sides of the Atlantic. “Human” represented something of a stylistic departure for the Human League, yet garnered the group another #1 hit in the U.S., where R&B was at the time more popular on the mainstream singles charts than it was in their native U.K. (where the song peaked only at #8). Jimmy Jam and Terry Lewis were brought in to produce the Human League’s 1986 album Crash in the immediate wake of the duo’s success as producers and main composers for Janet Jackson’s breakthrough album Control, released in February of that year. 16. As Covach aptly puts it, “the question is not ‘How does tonality work?’ but rather ‘How does tonality work with regard to these pieces?’” (1994, ). 17. In my earlier discussion of two-chord vamps, I must concede that I bypassed talking about III–IV (listed in Example 5) as yet another possible harmonic-functional interpretation for two whole-step related major chords. While III–IV shuttles are quite rare, the introduction to Tears for Fears’ hit “Head Over Heels” (U.S. #5, U.K. #12) from their 1985 album Songs from the Big Chair—which Clement (2013, 130, Figure 17) analyzes as an exemplar of Lydian harmony—is one such instance where I hear the shuttle of C major to D major chords (or, more accurately, oscillating open fifths on C and D, with two intertwining keyboard and guitar melodies sounding above) not as a Lydian I–II but rather as III–IV promising an A major tonic that emerges at the onset of the verse (which itself is built on another two-chord shuttle, I– III). To support this reading, I am hearing these chords against the backdrop of Type 5 in Walter Everett’s classification of tonal systems for rock music, i.e., “[major] triad-doubled or power-chord minor-pentatonic systems unique to rock styles: I– III–IV–V– VII” (2004, Table 1; see also Biamonte 2010, 104–5, which explains how this minor-pentatonic system can be rotated—e.g., “Pentatonic 4”: I– III–IV– VI– VII). My interpretation here may be controversial to some readers, but the main reason why I cannot help but hear the opening of “Head Over Heels” this way is because I associate it closely with another Tears for Fears hit from the same album, “Shout” (U.S. #1, U.K. #4), in which the verses are also built upon a III–IV shuttle (B –C) whose function has in this case been made clear in context of the I– VI–IV–I loop (G–E –C–G) of the chorus that opens the song. The only difference in “Head Over Heels” is that we hear the III–IV shuttle first. 18. See, for example, the opening to Debussy’s piano prelude “Des pas sur la neige” (1910), in which D remains omnipresent as a tonic pedal as the mode fluctuates from D Aeolian to D Dorian when the B s yield to B s. Stevie Nicks seems to be especially fond of evoking Lydian harmony in her songs, as in Fleetwood Mac’s 1977 megahit “Dreams” (U.S. #1, U.K. #24), another Nicks song built almost entirely upon an F major–G major shuttle. In this case, however, I agree with Ken Stephenson’s interpretation of the song’s ambiguous major or minor (but not Lydian) tonality: “The one instance of a harmony other than F and G, an A minor chord, favors A as tonic. Otherwise, the chords point more strongly to C than A. . . . The melody also ultimately favors C by ending each section on C. We need not decide ultimately whether the tonic is C or A: it may float between these two relative keys . . . , an appropriate situation in light of the subject matter of ‘Dreams’ and the sometimes surreal grammar of its lyrics. The point here is that an F Lydian hypothesis suggested by the harmonies must be abandoned once the melody begins” (2002, 42). 19. While I have shown only its first phrase in Example 8b, the verse melody of “Man on the Moon” is comprised of a series of six 4-bar phrases in the pattern aababa (truncated to aaba in subsequent verses), with the third and fifth phrases following essentially the same melodic contour as the first, but instead of the pitches G | F –E–D | C–D–C we hear C | B–A–A | E–F –E. The leap up to C4 at the onset of the third phrase anticipates the same C4 that initiates the melodic descent into G at the onset of the prechorus, but to my ears the tonal center does not yet shift to G major since the main melodic pitches—C | A | E—remain wedded to the underlying Lydian I–II –I. 20. In his 2001 article on “the expression of troubling societal values in postmodern [i.e., mainly 1990s] rock,” Walter Everett also hears C as the tonal center during the verses of “Man on the Moon,” where he interprets the use of Lydian tonality as a reflection of the “self-deprecating meaninglessness” conveyed by the lyrics. As Everett says, “we ultimately learn to accept the Lydian melody as aimless, as are the arbitrary, apathetic, and inscrutable lyrics it carries, all the perfect representation of the empty, detached world of Andy Kaufman’s anti-ideological parodies” (2001, 212). 21. A similar double-tonic complex occurs in Radiohead’s song “Reckoner” from In Rainbows (2007), in which the G major verses are built on a repeating IV–V–vi and the E minor bridge on a half-cadential iv–VI–V (with requisite raised leading tone), but no tonic chord appears in either key; see Osborn 2016, 149–51. 22. I am not the only scholar to have noticed this phenomenon, as evinced by two papers presented at the 2016 annual meeting of Society for Music Theory in Vancouver that also addressed the subject of recent pop hits composed entirely over a single repeating chord loop. In his “(Dys)Functional Harmony: How Sound Production in Twenty-First Century Pop Music Liberates Harmony from its Functional Role,” Asaf Peres argues that formal sections in these EDM-influenced harmonically repetitive songs are articulated primarily by differences in texture and sound production, where “[m]anipulations of sonic density and gestures such as filter sweeps and drum intensification have taken a lead role in delineating form and creating tension and release” (AMS-SMT 2016 Abstracts, 225). And in “‘I Know It’s Over’: Melodically-Established Keys and Tonal (Non-)Closure in Contemporary Popular Music,” Jeremy Smith draws upon my notion of absent tonics, analyzing several examples of recent hits in which “the tonic is only absent in its harmonic form, while it is very much present in its melodic form” (AMS-SMT 2016 Abstracts, 249). 23. “Viva la Vida” is a fine example of what I have called “cumulative form” in pop and rock music (see Spicer 2004), with Will Champion’s wordless countermelody (“oh-oh-oh-oh-ohh-oh”) being deliberately saved for the song’s climactic final chorus. 26. Only one of my students heard the “Get Lucky” loop in F minor, but in doing so agreed with Owen Pallett (2014b). 27. With his analysis depending mainly on the apparent 3̂–2ˆ–1ˆ descent in A major at the end of the chorus melody, Smith (2016) argues in favor of an absent-tonic reading of the “Get Lucky” loop, but we must be careful not to let any Schenkerian bias seduce us into thinking that all stepwise descending melodic figures at the ends of tunes necessarily involve scale degrees 3, 2, and 1. Nonetheless, in support of my B Dorian reading, I hear the chorus melody as composing out a larger 3̂–2ˆ–1ˆ descent from D to B, in tandem with the topmost notes of the piano chords. 28. Robin Attas (2015) adapts Christopher Hasty’s metric theory to better explain how we as listeners perceive autotelic grooves. See, for example, her analysis of the buildup introduction to Marvin Gaye’s 1968 version of “I Heard It Through the Grapevine” (279–81); see also Spicer 2004 and Fink 2011. 29. I should issue here a caveat about the soul dominant, since by the late 1970s this chord sometimes operated as a coloristic sonority for its own sake, irrespective of its dominant function (not unlike, for example, the way in which Debussy often composed passages that utilized harmonic planing of non-functional dominant-seventh chords). As we can see from the chord symbols in Example 11, the intro and chorus progression touches on A /B and C /D chords before arriving on the “true” soul dominant, G /A , at the end of the phrase. “Rock With You” was composed by Rod Temperton, who before collaborating with Jackson had first made a name for himself as keyboardist and primary songwriter for the 1970s U.K.-based disco group Heatwave. The opening two-chord shuttle from Heatwave’s debut single “Boogie Nights” (U.S. and U.K. #2 ) also features planed chords (Em9–Dm9). Such harmonic planing would quickly become a hallmark of Temperton’s chordal vocabulary and can be heard in his other top-ten hits written for Jackson; compare, for example, the introductions to “Off the Wall” (U.S. #10, U.K. #7 ) and “Thriller” (U.S. #4, U.K. #10 [1983/84]). 30. “Get Lucky” and “Rock With You” each tell similar tales of a long night of revelry: in the songs’ respective choruses, Pharrell sings “I’m up all night to get lucky” while Michael sings “I want to rock with you all night.” In “Get Lucky,” the autotelic groove invites infinite repetition and keeps the party going, but in “Rock With You” it is the never-ending search for an absent tonic. 31. The truck-driver’s modulation in “Rock With You” is actually far more complicated than in “She’s Gone,” since it does not involve a simple dominant handover (see n. 4 above). As shown by the chord symbols in Example 11, the instrumental break ends with a series of planed non-functional soul-dominant sonorities ascending stepwise, A /B –B /C–C /D , with the third of these chords bumping up by semitone to C/D, which in turn resolves deceptively into the Em9 chord that begins the final chorus (or, to think of it another way, the C/D chord functions in context as an applied soul dominant— VII11—to the ii9 chord that begins the final chord loop; see n. 3). The song then fades out on the chorus loop, searching for its new absent tonic of D major. 32. The Phrygian triadic modal system—relatively rare in pop and rock songs outside of the heavy metal genre—is not represented among the two-chord vamps in Example 5 but is certainly possible, as in Montell Jordan’s 1995 #1 hit “This Is How We Do It,” a song built entirely around a Phrygian shuttle, i– II. A “Locrian” system (with a V chord) is theoretically possible, but only if each degree of the scale is doubled with a triad or, more typically, a power chord with third omitted—as in Led Zeppelin’s “Immigrant Song” (1970), the chord pattern of which is best described not as Locrian, but a chromatically inflected version of rock’s fifth-doubled minor-pentatonic system, 15– 35–45– 55– 75; see Biamonte 2010, 108. 33. In his book Everything in Its Right Place: Analyzing Radiohead, Brad Osborn uses my suggested continuum of fragile, emergent, and absent tonics to shed light on the ephemeral tonal designs of several Radiohead songs (2016, 147–49). Spillman and Stein go on to discuss a well-known example of implicit tonality, the first song of Schumann’s 1840 Dichterliebe cycle, “Im wunderschönen Monat Mai,” in which “both the song’s recurring unresolved V7s throughout and ending on V7 convey the poet’s unfulfilled longing and desire” (1996, 135). This is not unlike what Ramon Satyendra, drawing upon the aesthetics of the Romantic fragment, calls “open structures” in the music of Franz Liszt, which he defines as “Liszt works that are based on a dissonant [i.e., non-tonic] chord, yet rooted in diatonicism” (1997, 205). Hall & Oates typified so-called “blue-eyed soul” in the 1970s, being one of the few white acts to emerge from Philadelphia’s burgeoning soul music scene early that decade. The chord most likely has varied origins, both in gospel piano playing and in American popular song from the first half of the twentieth century. The soul dominant is most commonly voiced as a IV triad over 5ˆ, but can also appear as a close position ii7 or IV7 chord in the right-hand part, hence adding a fifth note to the basic four-note sonority. An important feature to remember about the soul dominant is that, despite its dominant function, the chord contains the tonic note amidst its upper voices and never includes the leading tone. The four-note soul dominant is usually labeled in harmonic analyses with the functional Roman numeral V11, understood as shorthand for a V chord with intervals of a seventh, ninth, and eleventh above the bass (see, e.g., Temperley 2011, [3.10], and Tagg 2014, 228). While the soul dominant is most commonly found in songs in major keys (or, if you prefer, the Ionian mode), as in “She’s Gone,” it can be found in minor or Aeolian songs as well, in which case the chord typically is not built upon 5ˆ in the bass but rather 7ˆ, with a close position iv7, VI, or VI7 in the right-hand part above (in other words, the same pitches as the soul dominant from its relative major), hence serving as a substitute for the plain VII chord that often serves the functional role of dominant in modal rock harmony; for example, the main groove from A Taste of Honey’s 1978 #1 disco hit “Boogie Oogie Oogie” is built around oscillating D minor-seventh and B /C chords, or i7– VII11. Walter Everett defines a truck driver’s modulation as “a sudden shift from one tonal center to another—usually a half step above—that is not functionally related to the first” (1997, 118). Dai Griffiths prefers the term “elevating modulation” and presents a useful four-part schema to explain the four most common harmonic situations that typically occur in popular songs at the formal junctures of such modulations. Griffiths cites the final series of three consecutive T1 modulations in “She’s Gone” as a “breathtaking” example of his third type of elevating modulation, the “dominant handover” (2015, 38). One might interpret this opening vamp not as i–V in E minor but rather as iv–I in B major (i.e., with a borrowed minor iv chord), although this is not the way I hear it. Circular chord progressions in pop and rock songs are often ambiguous with regard to their tonal center, especially in instances where such short progressions could just as easily be interpreted in a major key or its relative minor (which is not the case in the “Reach Out” introduction, but we shall see that it is so in Prince’s “Little Red Corvette” and other examples later in this essay). The opening pitch in the flute melody, A , behaving in context more like 4ˆ in minor (as part of a 4–3 figure above 1ˆ in the bass) than a flatted seventh degree in major, tips the scale for me in the direction of E minor. For an extensive discussion of the notion of ambiguity in rock harmony, see Doll 2017, Chapter 6, “Ambiguous Effects”; see also Richards (forthcoming). As I have shown in parentheses above the staff, the guitars play quick G chords at the end of both measures within each two-bar cycle, but the bass guitar does not comply and instead carves out an active bass line around the chord roots of the oscillating ii–V progression. (An organ—buried deep in the mix—also simply moves back and forth between A and D chords without any intervening G chords.) I am therefore considering these metrically weak G chords as embellishing (neighboring) sonorities in the upper voices and not full-fledged chord changes. Flory (2017, 63) provides a transcription of the complete texture of this oscillating verse vamp. I had long thought that this E major chord sounding in the upper voices was played on a piano, but Motown expert Andrew Flory has confirmed for me that there is actually no piano on this track. Motown’s primary house keyboardist at the time, Earl Van Dyke, was contracted for the July 8, 1966 session when “Reach Out” was recorded (along with two other songs) and is therefore most likely the one playing the organ part. For an insightful analysis of “God Only Knows,” similarly focusing on the expressive effects of the unstable six-four chords and the song’s utter lack of resolution to a root-position tonic, see Harrison 1997, 39–40. This passage during the chorus of “Someone Saved My Life Tonight”—in which a promised cadence is evaded, and instead the music “backs up” to repeat the cadential idea—reminds me of a similar technique often utilized by late-eighteenth century composers (especially Mozart) to extend phrases, which Janet Schmalfeldt (1992) has called the “one more time” technique. 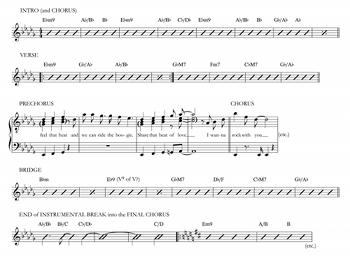 Christopher Doll (2011) uses the term “breakout chorus” to refer to any song whose chorus represents a marked increase in intensity over the preceding verse (a feature common to many if not most pop and rock songs), but especially those choruses involving a shift of tonal center from a minor key to its relative major. While I do not hear the verse of “Little Red Corvette” as fully “in” the key of B minor, so that the chorus does not “modulate” to D major, the expressive or “breakout” effect in this song is essentially the same at the moment the emergent tonic chord replaces vi. For a detailed exploration of this thorny issue of monotonality vs. “sectional tonality” and “sectional centricity” in rock music, see Capuzzo 2009. There is no easy answer to this question, but in my view, the deciding factor as to whether or not I interpret a song as sectionally tonal or monotonal with an emergent or absent tonic usually has to do with the expressive potential that comes from withholding a tonal center, as I hope to demonstrate further in the analyses that follow. Though such situations are rare, it is entirely possible for a song to have two or more competing yet equally important tonal centers but for the tonic chord to be absent in each of its sections, as we shall see with the Psychedelic Furs song “Love My Way” (Example 9b). It is also possible, of course, for major and minor triads related by whole step to function locally as V–vi in major, yet I can think of no example from the pop-rock repertoire in which we hear a repeating V–vi progression used as an extended vamp (i.e., V–vi with an “absent” I). After polling some experts on rock harmony, the closest example we could come up with is Bob Dylan’s “I Shall Be Free No. 10” from Another Side of Bob Dylan (1964)—specifically, the funny little repeated tag at the end of each strophe, V–vi–V–vi–V–I, where on its final iteration Dylan breaks the fourth wall by saying, “what’s probably got you baffled more is what this thing here is for.” I am grateful to Walter Everett for bringing this example to my attention. 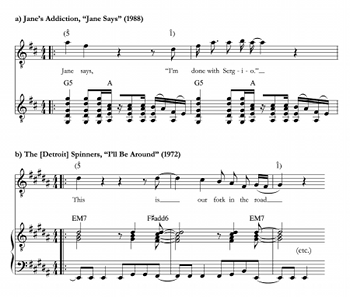 Interestingly, when playing “Jane Says” live (several 1990s performances of which can be found on YouTube), Jane’s Addiction would often append an instrumental introduction by jamming around the D major tonic chord before launching into the repeating IV–V riff, which suggests to me that Perry Farrell and company were fully aware of their song’s absent tonic. Nobile offers an analysis of “Jane Says” that shows how the vocal melody goes on to articulate a full-fledged AABA form, with the melody in the bridge (or B section) distinguishing itself by outlining scale degrees of the dominant harmony, “all by virtue of its melodic-harmonic divorce” (2015, 196). John Covach (2005) uses the term simple verse–chorus form to describe songs in which the verse and chorus are set over the same chord changes (as opposed to contrasting verse–chorus form which uses a different set of chord changes for the verse and chorus, examples of which we heard in “She’s Gone,” “Someone Saved My Life Tonight,” and “Little Red Corvette”). U.K. synthpop group the Human League are probably best known for their massive 1981 single “Don’t You Want Me,” which reached #1 on both sides of the Atlantic. “Human” represented something of a stylistic departure for the Human League, yet garnered the group another #1 hit in the U.S., where R&B was at the time more popular on the mainstream singles charts than it was in their native U.K. (where the song peaked only at #8). Jimmy Jam and Terry Lewis were brought in to produce the Human League’s 1986 album Crash in the immediate wake of the duo’s success as producers and main composers for Janet Jackson’s breakthrough album Control, released in February of that year. As Covach aptly puts it, “the question is not ‘How does tonality work?’ but rather ‘How does tonality work with regard to these pieces?’” (1994, ). In my earlier discussion of two-chord vamps, I must concede that I bypassed talking about III–IV (listed in Example 5) as yet another possible harmonic-functional interpretation for two whole-step related major chords. While III–IV shuttles are quite rare, the introduction to Tears for Fears’ hit “Head Over Heels” (U.S. #5, U.K. #12) from their 1985 album Songs from the Big Chair—which Clement (2013, 130, Figure 17) analyzes as an exemplar of Lydian harmony—is one such instance where I hear the shuttle of C major to D major chords (or, more accurately, oscillating open fifths on C and D, with two intertwining keyboard and guitar melodies sounding above) not as a Lydian I–II but rather as III–IV promising an A major tonic that emerges at the onset of the verse (which itself is built on another two-chord shuttle, I– III). To support this reading, I am hearing these chords against the backdrop of Type 5 in Walter Everett’s classification of tonal systems for rock music, i.e., “[major] triad-doubled or power-chord minor-pentatonic systems unique to rock styles: I– III–IV–V– VII” (2004, Table 1; see also Biamonte 2010, 104–5, which explains how this minor-pentatonic system can be rotated—e.g., “Pentatonic 4”: I– III–IV– VI– VII). My interpretation here may be controversial to some readers, but the main reason why I cannot help but hear the opening of “Head Over Heels” this way is because I associate it closely with another Tears for Fears hit from the same album, “Shout” (U.S. #1, U.K. #4), in which the verses are also built upon a III–IV shuttle (B –C) whose function has in this case been made clear in context of the I– VI–IV–I loop (G–E –C–G) of the chorus that opens the song. The only difference in “Head Over Heels” is that we hear the III–IV shuttle first. See, for example, the opening to Debussy’s piano prelude “Des pas sur la neige” (1910), in which D remains omnipresent as a tonic pedal as the mode fluctuates from D Aeolian to D Dorian when the B s yield to B s. Stevie Nicks seems to be especially fond of evoking Lydian harmony in her songs, as in Fleetwood Mac’s 1977 megahit “Dreams” (U.S. #1, U.K. #24), another Nicks song built almost entirely upon an F major–G major shuttle. In this case, however, I agree with Ken Stephenson’s interpretation of the song’s ambiguous major or minor (but not Lydian) tonality: “The one instance of a harmony other than F and G, an A minor chord, favors A as tonic. Otherwise, the chords point more strongly to C than A. . . . The melody also ultimately favors C by ending each section on C. We need not decide ultimately whether the tonic is C or A: it may float between these two relative keys . . . , an appropriate situation in light of the subject matter of ‘Dreams’ and the sometimes surreal grammar of its lyrics. The point here is that an F Lydian hypothesis suggested by the harmonies must be abandoned once the melody begins” (2002, 42). While I have shown only its first phrase in Example 8b, the verse melody of “Man on the Moon” is comprised of a series of six 4-bar phrases in the pattern aababa (truncated to aaba in subsequent verses), with the third and fifth phrases following essentially the same melodic contour as the first, but instead of the pitches G | F –E–D | C–D–C we hear C | B–A–A | E–F –E. The leap up to C4 at the onset of the third phrase anticipates the same C4 that initiates the melodic descent into G at the onset of the prechorus, but to my ears the tonal center does not yet shift to G major since the main melodic pitches—C | A | E—remain wedded to the underlying Lydian I–II –I. In his 2001 article on “the expression of troubling societal values in postmodern [i.e., mainly 1990s] rock,” Walter Everett also hears C as the tonal center during the verses of “Man on the Moon,” where he interprets the use of Lydian tonality as a reflection of the “self-deprecating meaninglessness” conveyed by the lyrics. As Everett says, “we ultimately learn to accept the Lydian melody as aimless, as are the arbitrary, apathetic, and inscrutable lyrics it carries, all the perfect representation of the empty, detached world of Andy Kaufman’s anti-ideological parodies” (2001, 212). A similar double-tonic complex occurs in Radiohead’s song “Reckoner” from In Rainbows (2007), in which the G major verses are built on a repeating IV–V–vi and the E minor bridge on a half-cadential iv–VI–V (with requisite raised leading tone), but no tonic chord appears in either key; see Osborn 2016, 149–51. I am not the only scholar to have noticed this phenomenon, as evinced by two papers presented at the 2016 annual meeting of Society for Music Theory in Vancouver that also addressed the subject of recent pop hits composed entirely over a single repeating chord loop. In his “(Dys)Functional Harmony: How Sound Production in Twenty-First Century Pop Music Liberates Harmony from its Functional Role,” Asaf Peres argues that formal sections in these EDM-influenced harmonically repetitive songs are articulated primarily by differences in texture and sound production, where “[m]anipulations of sonic density and gestures such as filter sweeps and drum intensification have taken a lead role in delineating form and creating tension and release” (AMS-SMT 2016 Abstracts, 225). And in “‘I Know It’s Over’: Melodically-Established Keys and Tonal (Non-)Closure in Contemporary Popular Music,” Jeremy Smith draws upon my notion of absent tonics, analyzing several examples of recent hits in which “the tonic is only absent in its harmonic form, while it is very much present in its melodic form” (AMS-SMT 2016 Abstracts, 249). “Viva la Vida” is a fine example of what I have called “cumulative form” in pop and rock music (see Spicer 2004), with Will Champion’s wordless countermelody (“oh-oh-oh-oh-ohh-oh”) being deliberately saved for the song’s climactic final chorus. Only one of my students heard the “Get Lucky” loop in F minor, but in doing so agreed with Owen Pallett (2014b). With his analysis depending mainly on the apparent 3̂–2ˆ–1ˆ descent in A major at the end of the chorus melody, Smith (2016) argues in favor of an absent-tonic reading of the “Get Lucky” loop, but we must be careful not to let any Schenkerian bias seduce us into thinking that all stepwise descending melodic figures at the ends of tunes necessarily involve scale degrees 3, 2, and 1. Nonetheless, in support of my B Dorian reading, I hear the chorus melody as composing out a larger 3̂–2ˆ–1ˆ descent from D to B, in tandem with the topmost notes of the piano chords. Robin Attas (2015) adapts Christopher Hasty’s metric theory to better explain how we as listeners perceive autotelic grooves. See, for example, her analysis of the buildup introduction to Marvin Gaye’s 1968 version of “I Heard It Through the Grapevine” (279–81); see also Spicer 2004 and Fink 2011. I should issue here a caveat about the soul dominant, since by the late 1970s this chord sometimes operated as a coloristic sonority for its own sake, irrespective of its dominant function (not unlike, for example, the way in which Debussy often composed passages that utilized harmonic planing of non-functional dominant-seventh chords). As we can see from the chord symbols in Example 11, the intro and chorus progression touches on A /B and C /D chords before arriving on the “true” soul dominant, G /A , at the end of the phrase. “Rock With You” was composed by Rod Temperton, who before collaborating with Jackson had first made a name for himself as keyboardist and primary songwriter for the 1970s U.K.-based disco group Heatwave. The opening two-chord shuttle from Heatwave’s debut single “Boogie Nights” (U.S. and U.K. #2 ) also features planed chords (Em9–Dm9). Such harmonic planing would quickly become a hallmark of Temperton’s chordal vocabulary and can be heard in his other top-ten hits written for Jackson; compare, for example, the introductions to “Off the Wall” (U.S. #10, U.K. #7 ) and “Thriller” (U.S. #4, U.K. #10 [1983/84]). “Get Lucky” and “Rock With You” each tell similar tales of a long night of revelry: in the songs’ respective choruses, Pharrell sings “I’m up all night to get lucky” while Michael sings “I want to rock with you all night.” In “Get Lucky,” the autotelic groove invites infinite repetition and keeps the party going, but in “Rock With You” it is the never-ending search for an absent tonic. The truck-driver’s modulation in “Rock With You” is actually far more complicated than in “She’s Gone,” since it does not involve a simple dominant handover (see n. 4 above). As shown by the chord symbols in Example 11, the instrumental break ends with a series of planed non-functional soul-dominant sonorities ascending stepwise, A /B –B /C–C /D , with the third of these chords bumping up by semitone to C/D, which in turn resolves deceptively into the Em9 chord that begins the final chorus (or, to think of it another way, the C/D chord functions in context as an applied soul dominant— VII11—to the ii9 chord that begins the final chord loop; see n. 3). The song then fades out on the chorus loop, searching for its new absent tonic of D major. The Phrygian triadic modal system—relatively rare in pop and rock songs outside of the heavy metal genre—is not represented among the two-chord vamps in Example 5 but is certainly possible, as in Montell Jordan’s 1995 #1 hit “This Is How We Do It,” a song built entirely around a Phrygian shuttle, i– II. A “Locrian” system (with a V chord) is theoretically possible, but only if each degree of the scale is doubled with a triad or, more typically, a power chord with third omitted—as in Led Zeppelin’s “Immigrant Song” (1970), the chord pattern of which is best described not as Locrian, but a chromatically inflected version of rock’s fifth-doubled minor-pentatonic system, 15– 35–45– 55– 75; see Biamonte 2010, 108. In his book Everything in Its Right Place: Analyzing Radiohead, Brad Osborn uses my suggested continuum of fragile, emergent, and absent tonics to shed light on the ephemeral tonal designs of several Radiohead songs (2016, 147–49).